Welcome to the Beginner's Guide to Toxikk. It is a first-person shooter video game is true to the motto: 1999 classic shooters like Quake Arena or Unreal Tournament oriented. For this reason, there are no classes in Toxikk and ranks that you can achieve with time. Also there are no game elements such as skills that can gain an advantage over other you in advance. Thus, the German developer Reakktor Studios wants to make sure that all players remain equivalent. Only the different weapons that can be found on the different maps will help you in the fight against your opponents. Below is some information and a list of tips that should help you get started in the game Toxikk. Before you dive into the Toxikk multiplayer, you should familiarize yourself with the control. Use its simply the Boot Camp. In this mode, you can play offline against bots and set on which map you want to play, how much will be your enemy, and so on. Put your opponents on the difficulty mode, of whom you think you can handle it and starts the round. You can play one hand, the game mode Bloodlust in Boot Camp. In this mode, play all against all. So shooting everything that moves. Instead, you play the Squad Assault mode, this is a team death match. The two teams are composed of the blue and the red Exocoms and Drayos. So try other team members as possible to kill. 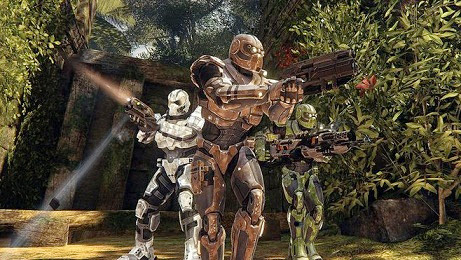 An important point for the boot camp is very likely that you may be better prepared in multiplayer, which is different maps to memorize. If you know your environment, you have a huge advantage. Select the boot camp as the map Foundation and play it a few rounds. When you start, you have to start only a handgun, the Raven. This is of course not very effective, which is why you should get it soon other weapons. The other weapons are scattered on the cards at various fixed points. So mark you exactly where to find, for example, the Bull Craft, a shotgun or the Falcon, a sniper rifle. Of course there are many more weapons you can find on the map. So you know exactly dicey situation where you will find a good weapon and not run constantly without looking for a gun around. When you start the game Toxikk, you will immediately notice that it plays faster than a conventional first-person shooter. Get used to quickly respond to it and also try quickly to opponents. Use to best address the Shift key as often as possible. If you press this, it makes the game a quick sprint forward. So you will be a lot faster in the game. Combine the Shift key best yet with spacebar. The Shift + Spacebar also used when you encounter an enemy. With a little practice, you can overcome your opponents. Even to aim and hit an enemy, if you make a sprint, is beginning a bit difficult, but you should also have a little practice, eventually get the hang of. Of course you can still be as good in Toxikk. But it will eventually kill even the best players from the opponent. In practice it would be if you could make the death to your advantage. Don’t worry, because that you can. If you push the game to the F key, your player falls over and appear dead to the other. This, you can take advantage of in many situations. So if you see an enemy in front of you, imagine dead and he is likely to run past you. So you can move you, until you reach a weapon. Of course you should not drop dead at any opponent. If you think that you know you are near a weapon, just sprinting down quickly and bring them to you. Another situation where it may be helpful to fall over dead, if you're in a gun battle with an opponent, you can pretend as if you have died and your opponent will probably not observe you for a hit. It is at a favorable moment to again and kill the enemy, who had not expected you. There are Toxikk in addition to the opportunity to play dead trick still a great way to further your opponent. If you namely in the game press the Q button, you will be invisible and activate the stealth mode. The new invisibility feature, of course, must somehow be usefully applied. You can do this capability, just like the play dead, use at the beginning of each round to safely come to a weapon without killing you an opponent with his powerful weapons immediately. You can also use this ability in combat. For example, if you only have a few HP and the fight is hopeless, you can quickly become invisible and flee from the enemy. But you can look naturally the enemy is sneaking around you to attack from ambush. However, if you shoot in stealth mode, listen to your invisibility and you will again visible. The invisibility is not unlimited and listens to a few seconds. On your screen you see below left, as long as you can still be invisible. To be able to become invisible again, you have to wait, because the energy of this mode charges after a while on. One or the other player has most likely noticed in the game that his life is not regenerate with time itself, as is normally the case in modern FPS games like Call of Duty. In the event that you have been made and have very little lives, the game remedy has created. So you can all over the maps at different points Medi find kits that heal you. Most of these heal your life by 20 or 25 points. However, they have only to heal their 100 HP. Do you find however Micro-Healths, cure you this. By 5 points and different from the Medi-kit on the 100 HP out On the Map "Foundation" are, for example, 5 Micro-Healths after another in a line. Do you have full life and collect them all, you have therefore 125 HP. In addition, you will find on the various maps and armor. These are also distributed at fixed points on the maps. Do you take any of these armors on, you will get 50 points of armor. This intercept some damage if you were hit by the enemy. In the game Toxikk, there are a variety of weapons that you can admire. Each of these weapons, in addition to the normal Primary fire mode also has a secondary fire mode. This enabled when you shoot with the right mouse button. The secondary fire mode is in many situations very helpful and depending on the weapon you can different cases to gain the upper hand. As an example we can take the Raven. This pistol has each player at the start of each round. In normal primary mode you shoot as normal on the opponent as you are used to from a pistol. However, in the secondary mode, the weapon gets into a 3 bullets burst mode. This means that the gun emits 3 shots in quick succession. However, they must then cool for about 1 second. You can surprise an opponent with it very quickly because you will meet with all three shots, target foe takes a lot of damage. So you are not quite so helpless when the opponent is standing with a much stronger weapon against you. In Toxikk is an Arena-First-person shooter, which is why the maps were also designed so that you can take advantage of your surroundings. You will find, among other things jump fields on the maps. Is she on top of one of them, you will throw into the hole. So you end up in other areas of the maps. However, you can in the air and shoot well to other enemies and dodge before them. But you can, for example, to jump on roofs of houses or projections, as it is possible in the map "Foundation". From there you have a good view and can shoot your opponents from above. Until this remember where the shots are coming from, it's usually too late for them. Of course, you should pay close attention to everything around you, the way her, even your enemies can attack you from advantageous positions. Responds quickly and act wisely depending on situation. If you Toxikk plays long, you will learn sometime by heart and can quickly change the numbering. Do you want but just quickly go to the strongest weapon that is in your possession, simply press the R key. Whether this weapon will then adjust to the situation, but is of course a matter of luck.